Description: New England. Celebrated map orientated South to North based on Adrian Block. Coloured. 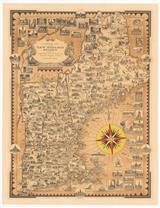 Description: A beautiful, sought after map of New England and New York, published in only one edition. Embellished with decorative cartouches and illustrations of native animals. Coloured. Description: New England. Published shortly after American Independence. The newly-established state of Vermont is shown, though its northern border with Canada is still under dispute and therefore left blank. Description: New England based on Jefferys. Inset of Boston and the harbour. Original colour. 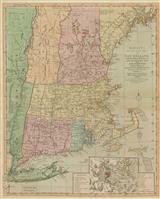 Description: New England with insets of Boston, New Haven and Nova Scotia. Printed colour.